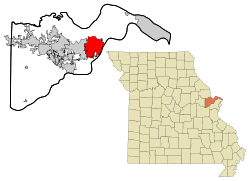 St. Charles is a city in and the county seat of St. Charles County, Missouri, United States. The population was 65,794 at the 2010 census, making St. Charles the second-largest city in St. Charles County. It lies to the northwest of St. Louis, Missouri on the Missouri River. Founded in 1765 as Les Petites Côtes, "The Little Hills", by Louis Blanchette, a French-Canadian fur trader, when the area was nominally ruled by Spain following the Seven Years War, it is the third-oldest city west of the Mississippi. For a time, it played a significant role in the United States' westward expansion. It was settled primarily by French-speaking colonists from Canada in its early days and was considered the last "civilized" stop by the Lewis and Clark Expedition in 1804, which was exploring the western territory after the United States made the Louisiana Purchase. The city served as the first Missouri capital from 1821 to 1826. It is the site of the Saint Rose Philippine Duchesne shrine. The city is the base for the St. Louis National Weather Service Forecast Office, serving central, east-central and northeastern Missouri, as well as west-central and southwest Illinois. "In the year 1765, a French Canadian, called Blanchette Chasseur, animated by that love of adventure which characterizes all who have lived a roving and restless life, ascended the Missouri, with a few followers, for the purpose of forming a settlement in the then remote wilderness. According to Hopewell's rather romantic account, Blanchette met another French Canadian (Bernard Guillet) at the site of St. Charles in 1765. Blanchette, determined to settle there, asked if Guillet, who had become a chief of a Dakota tribe, had chosen a name for it. Blanchette settled there in 1769 under the authority of the Spanish governor of Upper Louisiana (the area had been ceded by France to Spain under an agreement with Great Britain following French defeat in the war). He was appointed as its civil and military leader, serving until his death in 1793. During this time perhaps only a couple dozen buildings were built. Although the settlement was under Spanish jurisdiction, the settlers were primarily French Canadians who had migrated from northern territories. The first church, built in 1791, was Catholic and dedicated to the Spanish saint San Carlos Borromeo. The town became known as San Carlos del Misuri: "St. Charles of the Missouri". This church was destroyed by a tornado in 1916. The Spanish Lieutenant-Governor Carlos de Hault de Lassus appointed Daniel Boone as commandant of the Femme Osage District, which he served until the United States government assumed control in 1804 following the Louisiana Purchase. The name of the town, San Carlos, was anglicized to St. Charles. William Clark arrived in St. Charles on May 16, 1804. With him were 40 men and three boats; they made final preparations, as they waited for Meriwether Lewis to arrive from St. Louis. They attended dances, dinners, and a church service during this time, and the town residents, excited to be part of the national expedition, were very hospitable to the explorers. Lewis arrived via St. Charles Rock Road on May 20. The expedition launched the next day in a keelboat at 3:30 pm. St. Charles was the last established American town the expedition visited for more than two and a half years. Gottfried Duden was a German who visited in the area in 1824. Travelling under the guidance of Daniel M. Boone, he wrote extensive accounts of life in St. Charles County during his year there. He published these after returning to Germany in 1829, and his favorable impressions of the area led to the immigration of a number of Germans in 1833. The first permanent German settler in the region was probably Louis Eversman, who arrived with Duden but decided to stay. St. Charles, Missouri, is where the first claimed interstate project started in 1956. A state highway marker is displayed with a logo and information regarding this claim, off Interstate 70 going westbound, to the right of the First Capital Drive exit. Kansas and Pennsylvania also lay claim to the first interstate project. The City of St. Charles school district has five elementary schools, two middle schools, two high schools, and the Lewis & Clark Tech Building located on Zumbehl Road. St. Charles High School (sometimes called SCHS or simply "High") was the first built of the two high schools. St. Charles West (SCW or simply "West") was added in the late 1970s in response to the city's growing population. St. Charles West had its first graduation in 1979. St. Charles High School underwent renovation in 1995 to improve both the exterior and interior of the building, as did St. Charles West in 2005, in which a new library and auxiliary gym were built. The city is also served by Jefferson Intermediate, which has all 5th and 6th grade classes, and Hardin Middle School, which has all 7th and 8th grade classes. Other schools are associated with the Francis Howell and the Orchard Farm school districts, which also serve parts of St. Charles. Many students who live on the southern edge of St. Charles City attend Henderson, Becky David and Harvest Ridge elementary schools, Barnwell Middle, and Francis Howell North High School. The Orchard Farm School District, to the North, also serves St. Charles but is based outside the city. like Francis Howell. It has two elementary schools, a middle school, and a high school. St. Charles was also home to the now defunct St. Charles College (Missouri) (which should not be confused with St. Charles Community College). St. Charles lies at one end of the Katy Trail, a 225-mile (362 km) long state park enjoyed by bikers and walkers which was adapted from railroad right-of-way. Since the late 1970s, there has been healthy new home construction, commercial growth and explosive population growth in the St. Charles area. The phrase "Golden Triangle" was coined for this area in the Eighties, referring to the rate of real estate development in the St. Charles County region bordered by highways Interstate 70, Interstate 64, and Route 94. St. Charles City has a historic shopping district at a pedestrian scale. It offers most standard living features (with the exception of a public golf course) usually found in a community of its size. The City also has many special events and features related to the Lewis and Clark Expedition. In 2007, St. Charles welcomed men's professional road bicycle racing riders and fans as it served as the stage 5 final for the 2007 Tour of Missouri. The St. Charles Convention Center brings visitors to town. The Family Arena, a city-owned 11,000-seat venue, was built in the early 1990s near the Missouri River; it is used minor league sports franchises and hosts events. The city has been home to several minor league sports teams. The Missouri River Otters hockey team of the United Hockey League, played from 1999 until the team folded in 2006. The River Otters played at the 11,000-seat Family Arena owned by the city of St. Charles. The St. Louis Steamers was a professional indoor soccer team that played in the Family Arena from 2000–2001 and 2003-2004. The River City Rage professional indoor football team played in St. Charles from 2001 until 2005, and from 2007-2009. The team suspended operations for 2010. The Indoor Football League noted the team could return in 2011 if new owners are found. Oktoberfest, held near the river, celebrates the historic German influence on the city. Many vendors sell beer and other German goods. It includes a parade. Missouri Tartan Day is a celebration of Scottish American Heritage and Culture held each Spring, coinciding as closely as possible with April 6. This is the anniversary of the signing of the Declaration of Arbroath in 1320. The Founding Fathers are said to have drawn from this document in drafting the our own Constitution. The event features a parade with marching bagpipers from around the World and region, Scottish heavy athletics (caber toss, hammer throw, etc. ), musical entertainment, traditional and contemporary foods and lots of fun. Highlights include the Kirkin' o' the Tartans (ceremony of blessing for the Scottish clans), displays of traditional Scottish clan Tartans, and demonstrations of traditional Scottish activities and games. St. Charles is located at 38°47′19″N 90°30′42″W﻿ / ﻿38.788698, -90.511764Coordinates: 38°47′19″N 90°30′42″W﻿ / ﻿38.788698, -90.511764. According to the United States Census Bureau, the city has a total area of 24.03 square miles (62.24 km2), of which, 23.65 square miles (61.25 km2) is land and 0.38 square miles (0.98 km2) is water. As of the census of 2010, there were 65,794 people, 26,715 households, and 16,128 families residing in the city. The population density was 2,782.0 inhabitants per square mile (1,074.1 /km2). There were 28,590 housing units at an average density of 1,208.9 per square mile (466.8 /km2). The racial makeup of the city was 87.5% White, 5.9% African American, 0.3% Native American, 2.5% Asian, 0.1% Pacific Islander, 1.8% from other races, and 1.9% from two or more races. Hispanic or Latino of any race were 4.2% of the population. In the city the population was spread out with 23.4% under the age of 18, 12.0% from 18 to 24, 30.5% from 25 to 44, 22.0% from 45 to 64, and 12.2% who were 65 years of age or older. The median age was 35 years. For every 100 females there were 96.3 males. For every 100 females age 18 and over, there were 93.7 males. ^ "Historic Saint Charles". Greatriverroad.com. http://www.greatriverroad.com/stcharles/stcharleshome.htm. Retrieved 2011-08-02. ^ "Timeline". Stcharlescitymo.gov. http://www.stcharlescitymo.gov/AboutStCharles/Timeline/tabid/296/Default.aspx. Retrieved 2011-08-02. ^ "St. Charles: Missouri's First Capitol". Slfp.com. http://www.slfp.com/SLFP-StCharles.htm. Retrieved 2011-08-02. ^ Shrine of St. Philippine Duchesne, Academy of the Sacred Heart. Retrieved 2009-10-15. ^ "National Weather Service Weather Forecast Office - St. Louis MO". Crh.noaa.gov. 2010-09-23. http://www.crh.noaa.gov/lsx/. Retrieved 2011-08-02. ^ "Abbeville Institute 2008 Lindenwood Summer School". Abbevilleinstitute.org. http://abbevilleinstitute.org/Lindenwood/08Lindenwood.htm. Retrieved 2010-07-11. ^ "article mentioning St. Charles College". Libraryindex.com. http://www.libraryindex.com/encyclopedia/pages/cpxks3u3m5/charles-missouri.html. Retrieved 2011-08-02. ^ "Missouri River Otters of the UHL at". Hockeydb.com. http://www.hockeydb.com/stte/missouri-river-otters-6901.html. Retrieved 2011-08-02. ^ "Owner shuts down IFL’s River City". Billingsgazette.com. 2009-10-17. http://billingsgazette.com/sports/football/professional/arena/article_321968be-baf2-11de-abac-001cc4c03286.html. Retrieved 2011-08-02. ^ "First interstate project". Fhwa.dot.gov. http://www.fhwa.dot.gov/infrastructure/rw96h.cfm. Retrieved 2011-08-02. "Frenchtown Historic District" (PDF). Missouri Department of Natural Resources. http://dnr.mo.gov/shpo/nps-nr/91000216.pdf. Retrieved 2008-05-30. "St. Charles Historic District" (PDF). Missouri Department of Natural Resources. http://dnr.mo.gov/shpo/nps-nr/70000856.pdf. Retrieved 2008-05-30. "St. Charles Historic District (Boundary Increase #2)" (PDF). Missouri Department of Natural Resources. http://dnr.mo.gov/shpo/nps-nr/91000504.pdf. Retrieved 2008-05-30. "St. Charles Historic District (Boundary Increase #3)" (PDF). Missouri Department of Natural Resources. http://dnr.mo.gov/shpo/nps-nr/96001087.pdf. Retrieved 2008-05-30. This page uses content from the English language Wikipedia. The original content was at St. Charles, Missouri. The list of authors can be seen in the page history. As with this Familypedia wiki, the content of Wikipedia is available under the Creative Commons License.